Special packages are available for the following procedures: Ovariectomy (“spay”), gastropexy, cryptorchidectomy, or a combination of the above (aka ovariectomy AND gastropexy). Patients must be healthy. For additional details click here. Referral only. The Soft Tissue and Oncologic Surgery service cares for small animal patients with a variety of “soft-tissue” diseases and conditions. Our service works hand-in-hand with the other specialists within the VH, including radiologists, oncologists, internal medicine and critical care specialists. 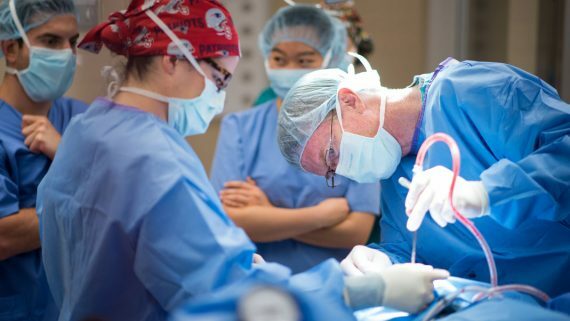 This integrated approach to treating complex surgical problems is the key to our success and the core of our program. Because of this, we are able to offer state of the art pre- and postoperative diagnostic imaging, including CT scans, ultrasound, and radioisotope scans. Similarly, the surgical management of cancer rarely stands alone, but instead requires a close working relationship between oncologic and surgical specialists. Therefore, individualized treatment plans for our cancer patients include pre- or postoperative radiation therapy and/or chemotherapy when appropriate. Additionally, since many of our patients require 24 hour postoperative monitoring due to the seriousness of their condition, we work closely with our fully staffed ICU and critical care specialists to ensure the best possible care for our patients. Our faculty and staff are committed to helping owners make informed decisions regarding the care of their pet. The Soft Tissue & Oncologic Surgery service is a referral-only service. Once the primary veterinarian calls and sets up the referral, the owner may call and arrange an appointment. If the patient has been seen by our service recently, owners may call directly to set up an appointment. New patient non-emergency appointments are scheduled on Tuesday & Thursday mornings.